One of the things that we love most is sharing the ocean’s wonders and sea-inspired living…and so today’s post is especially close to the heart! It’s sea creature awesomeness, ocean conservation, and mindful living all in one. Woot woot!! Did you know that some kinds of seafood are ocean-friendly but many aren’t? 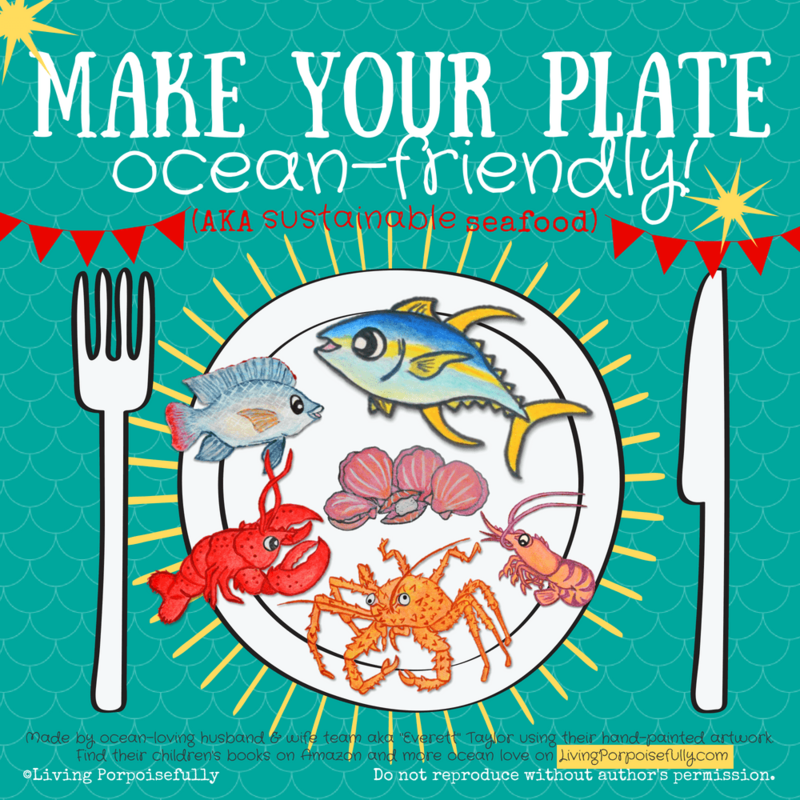 By choosing only ocean-friendly seafood!!! Of course, we’ve used our spunky sea-themed artwork from our children’s books, with some that’s never been seen before! We’re sharing why some seafood isn’t ocean friendly: overfishing, bycatch, pollution, and habitat destruction. Bycatch: Some methods result in the deaths of innocent bystanders like dolphins and turtles who can’t get out of nets, or get hooked on a line and then can’t get air. Pollution: You might think fish farms are the way to go, but some actually put all sorts of yucky toxins into the environment. Habitat Destruction: Some fishing methods are done in a way that’s terrible for the environment like ripping up coral reefs and bottom habitats. And, most importantly, we’re sharing how to find ocean-friendly seafood so that we can all help tip the ocean into a better balance. Our seafood choices make a difference in the health of the ocean! So, when you head to the grocery store, take a look on seafood packages for the symbols in the infographic above (or look for the word sustainable). Be a Sherlock Holmes and use your detective skills to ensure it’s an ocean-friendly choice! If you’re at a restaurant, you can ask the chef or server, or you can look it up (if the menu or chef can tell you where it came from/how it was caught) on SeafoodWatch.org or the Seafood Watch app. You can also download a free Seafood Watch pocket guide for you, your family, your students, etc. that’s specific to your region! (They’ll also ship a bunch to you if you want to give them out in large numbers.) That way, the guide can be put in a purse or wallet to be handy wherever you go. It takes a little bit of thoughtful detective work of what seafood choice is best for our ocean – but boy does it make a difference. The ocean needs our help, and our seafood choices are one of the most direct ways that are very much in our individual hands. Plus, the more you start asking your local restaurants and grocery stores, the more they will put a priority on making their selection ocean-friendly to satisfy customers like yourself. Oh, and we’ll be rolling out some more new fun Sustainable Seafood activities for kids very soon, so stay tuned.